SANTIAGO, Chile — The evil of sexual abuse committed by members of the clergy has betrayed the trust of the faithful and caused suffering to those in priesthood and religious life who bear the consequences of their brethren’s sins, Pope Francis said. He also recognized the efforts of the country’s priests and religious to “respond to this great and painful evil,” and he said he knew sometimes innocent priests and men and women religious are often viewed with suspicion by others. 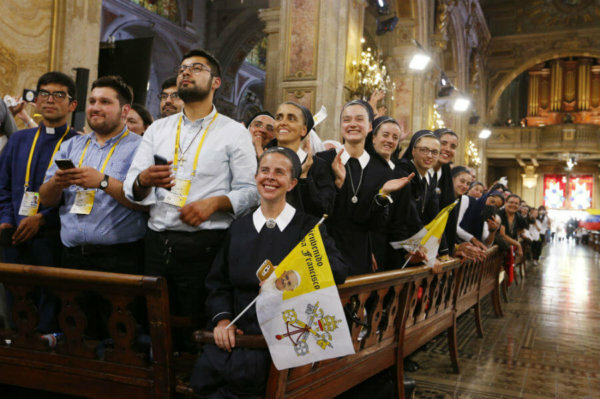 “I know that at times you have suffered insults in the subway or walking in the street; that by going around in clerical attire in many places, you pay a heavy price,” Pope Francis said during the meeting in Metropolitan Cathedral. Chilean media reported vandalism at Divine Providence Parish, not far from O’Higgins Park, where the pope celebrated Mass. Vandals spray painted the words “complice” (“accomplice”) and “papa arde” (“burn, pope”) on the facade of the church below a banner welcoming Pope Francis. The pope also has drawn ire because of his appointment of Bishop Juan Barros as head of the Diocese of Osorno, due to the bishop’s connection to Father Fernando Karadima, his former mentor. Father Karadima was sentenced to a life of prayer and penance by the Vatican after he was found guilty of sexually abusing boys. Bishop Barros, along with the country’s bishops, attended the pope’s meeting with the clergy. Arriving at the cathedral, the pope was welcomed by thousands of men and women chanting “Viva il papa” (“Long live the pope”). He then laid a single white rose on the altar of a chapel in the cathedral and silently prayed for a moment before taking his seat. “One does not love ideal situations or ideal communities; one loves people,” the pope said. After delivering his talk, Pope Francis met briefly with the country’s bishops in the cathedral sacristy. Bishops, he said, should not be paternalistic or authoritarian when dealing with their clergy, but rather imitate St. Joseph. “Stay close to your priests, like St. Joseph, with a fatherhood that helps them to grow and to develop the charism that the Holy Spirit has wished to pour out upon your respective presbyterates,” the pope said.